In a 6-3 decision, the Supreme Court ruled that Thomas Miller-El, a Texas death row inmate, is entitled to a new trial in light of strong evidence of racial bias during jury selection at his original trial. In choosing a jury to try Miller-El, a black defendant, prosecutors struck 10 of the 11 qualified black panelists. The Supreme Court said the prosecutors' chosen race-neutral reasons for the strikes do not hold up and are so far at odds with the evidence that pretext is the fair conclusion. The selection process was replete with evidence that prosecutors were selecting and rejecting potential jurors because of race. And the prosecutors took their cues from a manual on jury selection with an emphasis on race. Justice Souter, writing for the majority, set out the evidence that race governed who was allowed on the jury, including: disparate questioning of white and black jurors, jury shuffling, a culture of bias within the prosecutor's office, and the fact that the prosecutor's race-neutral explanations for the strikes were so far at odds with the evidence that the explanations themselves indicate discriminatory intent. In 2002, Miller-El had previously petitioned the federal courts to enforce the rule of Batson v. Kentucky, which prohibits racial discrimination in the exercise of peremptory challenges in jury selection. The federal District Court denied him habeas relief and the Fifth Circuit ruled that there were no appealable issues, and denied a certificate of appealability. In 2003, the Supreme Court reversed, finding that reasonable jurists could differ on whether Miller-El had appealable issues and ordered that the Fifth Circuit to grant a certificate of appealability to further review the case (Miller-El v. Cockrell, 537 U. S. 322 (2003)). The Court, in an 8-1 opinion, criticized the Fifth Circuit's "dismissive and strained interpretation" of critical facts and ruled that the lower court's refusal to consider Miller-El's Batson claim was based upon a standard of review that was too demanding. On remand, the Fifth Circuit held that Miller-El failed to show by clear and convincing evidence that the state court's finding of no discrimination was wrong, whether his evidence was viewed collectively or separately. The Supreme Court reversed again. Because this was a habeas corpus proceeding, the Court needed to find that the state court's interpretation of the facts was unreasonable under the Anti-Terrorism and Effective Death Penalty Act of 1996. The Court stated that the Texas courts finding of no discrimination "blinks reality," and was both unreasonable and erroneous, reversing the Fifth Circuit, and granting Miller-El habeas relief and a new trial. (See Associated Press, June 13, 2005). Read the complete decision. See also Race. To view a video (need RealPlayer) about the Miller-El case, click here. On February 25, 2003, the U.S. Supreme Court issued an 8-1 decision in favor of Thomas Miller-El, a Texas death row inmate who claimed that Dallas County prosecutors engaged in racially biased jury selection at the time of his trial in 1986. The Court ruled in Miller-El v. Cockrell that Miller-El should have been given an opportunity to present evidence of racial bias during his federal appeal. The Court sent the case back to a lower court, where Miller-El could be granted a new hearing on his claims. "Irrespective of whether the evidence could prove sufficient to support a charge of systematic exclusion of African-Americans, it reveals that the culture of the district attorney's office in the past was suffused with bias against African-Americans in jury selections," Justice Anthony M. Kennedy wrote. (Associated Press, February 25, 2003) Read the opinon. Miller-El asserts that Dallas County prosecutors systematically excluded African-American jurors during his trial. Ten of the 11 potential black jurors were eliminated by the prosecution. In their final analysis, the lower courts discounted evidence that, until at least the mid-1980s, prosecutors employed a policy of removing as many black jurors as possible from trials of black defendants. In its 1986 ruling in Batson v. Kentucky, the U.S. Supreme Court reaffirmed that it is unconstitutional to strike jurors solely on the basis of race and put a greater burden on the state to show that it was not engaging in such behavior. Prior to this decision, prosecutors did not have to provide a reason for striking potential jurors. This opinion was issued one month after Thomas Miller-El was convicted and sentenced to death, but applied retroactively to his case because his sentence was still on direct appeal. In Miller-El v. Cockrell, the Justices will examine whether the lower courts' failure to examine Dallas County's history of racial discrimination in conjunction with the prosecutorial strikes in Miller-El's case was proper. Article in the New York Times addressing the arguments in the second Miller-El case heard by the Supreme Court. Article in the Los Angeles Times regarding the second Miller-El case. Timeline on the case from the Dallas Morning News. To view a video (need RealPlayer) about the Miller-El case, click here. The scene at the Supreme Court as a Texas death penalty case was argued Monday morning was strikingly familiar. The 2 lawyers who stood before the justices were the same 2 who argued for the same parties two years ago: Seth P. Waxman representing Thomas Miller-El, a convicted murderer; and Gena A. Bunn, representing the State of Texas, which has been trying to execute Mr. Miller-El for 19 years. And these were the same justices - except Chief Justice William H. Rehnquist, who is under treatment for thyroid cancer and will participate in the case from home - who ruled in February 2003 by a vote of 8 to 1 that Mr. Miller-El's evidence of discrimination in the composition of his jury was enough to entitle him to a hearing before a federal appeals court. That court, which had earlier dismissed his case, followed the order to reconsider it and promptly dismissed it again, rejecting the Supreme Court's majority analysis and adopting that of its sole dissenter, Justice Clarence Thomas. But if all those elements were the same, there was also a difference. 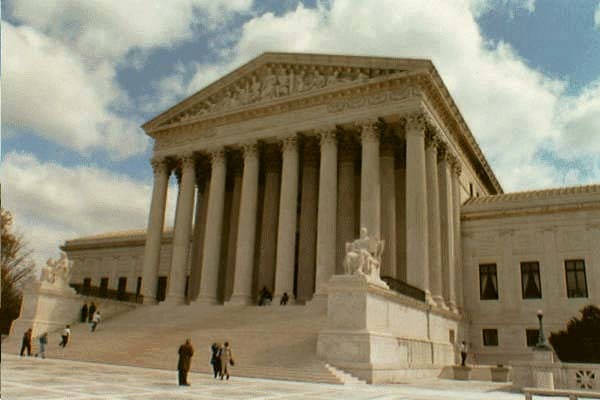 In the intervening 2 years, the Supreme Court has made clear its growing unease with the administration of the death penalty in Texas and its exasperation with the state and federal courts that hear appeals from the state's death row. The Supreme Court was now taking the unusual step of hearing Mr. Miller-El's appeal from the United States Court of Appeals for the Fifth Circuit for a 2nd time, and several justices indicated that the concerns they expressed the 1st time had not been allayed. Although Mr. Miller-El's life was at stake, in a sense it was the appeals court that was on trial in Miller-El v. Dretke, No. 03-9659. "This case was here before and we all read the majority opinion," Justice Stephen G. Breyer told Ms. Bunn, an assistant state attorney general. "It might be in my interest if people followed dissents more often," he added wryly, while noting that it was the majority opinion and not the dissent that was binding on the appeals court. Mr. Miller-El, a black man, was convicted of killing a clerk at a Holiday Inn in Dallas in 1985. Although the case is now in a new procedural stance, the underlying question is the same: did Texas prosecutors violate Mr. Miller-El's constitutional rights by deliberately excluding black jurors from his 1985 murder trial on the basis of their race? Justice Breyer described the basis for the majority's previous conclusion that the way Mr. Miller-El's jury was chosen gave rise to a "strong suspicion" of racial discrimination. "I think that's what it is unless you have something to the contrary," he said. "What came out in the Fifth Circuit to change it? Is there something different in the Fifth Circuit that wasn't there before?" Ms. Bunn replied that while the Supreme Court had looked at the "big picture" of the case, the Fifth Circuit appeals court had properly examined the precise circumstances that led to the removal of each black juror and found that each was "race-neutral and case-related." The prosecution struck 10 of 11 black jurors; 6 of those strikes are now in dispute. Mr. Waxman, Mr. Miller-El's lawyer, argued in the 1st round and again on Monday that in removing black jurors from a black defendant's trial, the prosecution used a double standard, accepting white jurors while striking blacks who expressed equivalently ambiguous sentiments on whether they could impose the death penalty. Mr. Waxman, who served as solicitor general during the Clinton administration, said that it was the big picture, "the totality of the evidence, the sheer weight of mutually reinforcing evidence" that the justices needed to look at to grasp what happened 19 years ago in a Texas courtroom and then to understand why the Fifth Circuit's finding of no constitutional violation was "unreasonable." "Let me switch metaphors on you. It is pointillistic. It's like walking up close to a Seurat and looking at a red dot and saying it's not necessarily a handbag. As a reviewing court, you have to step back and look at this." Part of the context Mr. Waxman emphasized was a documented history of racial discrimination in the Dallas prosecutor's office. The two prosecutors who handled the jury selection in Mr. Miller-El's case were found by the Texas Court of Criminal Appeals to have engaged in improper racial discrimination in the selection of juries in other cases during the same period of the mid-1980's. "Don't we have to have some reason to believe that the evidence of past practice has become irrelevant?" Justice David H. Souter asked Ms. Bunn. "Is it plausible to think there had been this change of heart?" Ms. Bunn began her answer by saying that Mr. Miller-El was asking the court to assume that race was the only reason for the removal of the jurors. Justice Souter cut her off. "That's not his argument at all," he said, adding: "He's saying there is very strong circumstantial evidence that what tipped the prosecution to make the challenges here is racial. He's not saying nothing else could have been involved. He's saying race tipped it. Is there any reason that is unsound?" The reason, Ms. Bunn answered, was that "the 6 strikes were not based on race" but because the black members of the jury pool expressed greater qualms about the death penalty than did the white members. Justice Breyer then read from the record of what comparative pairs of jurors said in answers to questions about the death penalty; blacks whom the prosecution then struck, and whites who were allowed to remain. "I look at that and I say, 'My goodness, it's pretty hard to say' " whether there was any meaningful difference in the answers, Justice Breyer told Ms. Bunn. The court's previous decision, Miller-El v. Cockrell, did not resolve the claim of discrimination. Rather, the justices held that the Fifth Circuit had erroneously failed to issue a "certificate of appealability" authorizing Mr. Miller-El to pursue his case through a petition for a writ of habeas corpus. Now the merits of the case are before the justices. The state's insistence that there was a meaningful difference in potential jurors' answers on their attitude toward the death penalty is crucial to its defense of what occurred during jury selection. Under the Supreme Court's 1986 decision in Batson v. Kentucky, the use of peremptory challenges to shape a jury on a basis that appears to be racial is presumed unconstitutional unless the prosecution can provide a reason unrelated to race. Qualms about the death penalty would be an acceptable reason unless black and white jurors were held to different standards. While Mr. Miller-El's case was tried shortly before the Supreme Court issued the Batson decision, the ruling applies to him retroactively. Nonetheless, the timeline proved something of a trap for Ms. Bunn and her vocal ally, Justice Scalia. Several justices questioned the prosecution's practice of using cards to note the race of potential jurors in the pool. Justice Scalia provided a potential explanation for a practice that these justices found troubling. "Maybe the prosecution didn't want to come up with an all-white jury for fear it would be challenged," he said. Ms. Bunn readily agreed. "It was necessary to keep track, as Justice Scalia noted, to be certain that you don't run afoul of Batson," she said. Justice John Paul Stevens said, "Batson hadn't been decided yet." Death row inmate's lawyers say appellate judges didn't heed sufficiently an order to review their client's claim of racial bias. The U.S. Supreme Court is known for not liking to have to repeat itself. In a case before it this week, though, attorneys for a Texas death row inmate are joined by a coalition of courtroom veterans and citizen groups in asking the court to say it again, louder. Last year, the high court rebuked a trio of federal appeals court judges for failing to adequately review the claims of a black inmate who argued that prosecutors had unfairly excluded African Americans from the jury in his 1986 murder trial. Prosecutors said they were simply trying to get jurors sympathetic to the death penalty. By a vote of 8 to 1, the high court sent the case back to the U.S. 5th Circuit Court of Appeals with directions to reexamine whether jury selection was tainted. "Happenstance" cannot explain why more than 90% of the eligible black jurors were rejected by the prosecutors, Justice Anthony M. Kennedy wrote for the majority. The 5th Circuit looked at the case again, and in February, let stand the conviction of 53-year-old Thomas Miller-El. Those asking the Supreme Court to intervene a 2nd time argue that the review was so cursory that the authority of the high court has been defied. Rather than basing its review on the majority opinion in the case, the 5th Circuit relied on the rationale offered by prosecutors and the lone justice who dissented in the case, they say. Miller-El's lawyers have been joined in the new appeal to the Supreme Court by former FBI Director William S. Sessions and a coalition of former federal judges and prosecutors, the NAACP Legal Defense Fund, Common Cause and the League of Women Voters. The high court has scheduled a conference on the case for Thursday. If the 5th Circuit ruling stands, it "will undermine the public reputation and integrity of the courts," according to a brief filed on behalf of the dozen former federal judges and prosecutors. "It seems to me that the 5th Circuit is thumbing its nose at the Supreme Court," said John Gibbons, a member of the group and a former 3rd Circuit Court of Appeals judge appointed by President Nixon. "You don't have the rule of law if intermediate appellate courts think they can ignore directions from the top." The judges' brief asserts that the 5th Circuit "disregarded specific conclusions drawn by [the Supreme] Court," among them that prosecutors questioned prospective black more jurors more intensely about their attitudes on the death penalty than prospective white jurors. Rather than conducting its own analysis, the brief says, the 5th Circuit "adopted, sometimes verbatim and always without attribution," prosecution arguments and the dissenting opinion written by Justice Clarence Thomas. The brief, submitted by Miller-El's lead lawyer, Jim Marcus of the Texas Defender Service, and Washington attorney Seth P. Waxman, also contends that the 5th Circuit flouted the Supreme Court's ruling. The case stems from a 1985 robbery at a Holiday Inn in a Dallas suburb by Miller-El, his wife Dorothy and Kenneth Flowers. Hotel employee Doug Walker was shot and died from his wounds; fellow worker Donald Hall survived and testified against Miller-El. The state sought the death penalty only against Miller-El, having concluded that he was the triggerman. The jury that convicted Miller-El and voted for a death sentence consisted of nine whites, one Latino, one Philippine American and one African American. Miller-El's lawyers argued at the time that prosecutors had systematically excluded African Americans from the jury pool by making challenges based on race and utilizing "jury shuffles," a process whereby attorneys are able to rearrange the order in which prospective jurors come up for questioning. Those claims were rejected by the trial judge, Texas appeals courts, a federal district judge and a 5th Circuit panel composed of Harold R. DeMoss Jr., an appointee of President George H.W. Bush, and W. Eugene Davis and Edith H. Jones, both appointed by President Reagan. Jones frequently has been mentioned as a possible nominee for the Supreme Court if a vacancy occurs during the presidency of George W. Bush. Last year, the high court said the trio, like the other courts that had reviewed the case, had turned a blind eye to evidence that prosecutors violated the law. During appeals, the Texas attorney general's office maintained that the Dallas prosecutors had done nothing wrong. Although the Supreme Court did not overturn the conviction, it did rule that Miller-El had presented sufficient evidence of bias to entitle him to a full hearing on the issue. In his majority opinion, Kennedy noted that prospective black jurors were subjected to more penetrating questions about their attitudes on the death penalty. Moreover, Kennedy emphasized that evidence showed that "the culture of the district attorney's office [in Dallas] in the past was suffused with bias against African Americans," and that the appeals court had failed to take sufficient account of this. "We question the dismissive and strained interpretation" that permitted the 5th Circuit judges to explain away the evidence, Kennedy wrote. In his dissent, Thomas said Miller-El had failed to present "anything resembling clear and convincing evidence of purposeful discrimination." A year later, after rehearing the case, the same three 5th Circuit judges came to the same conclusion as they had the first time, affirming the decision of a federal trial judge who had rebuffed Miller-El's claims that his constitutional rights had been violated. In opposing further Supreme Court review, Gena Bunn of the Texas attorney general's office countered that the 5th Circuit "conscientiously followed the dictate" of the Supreme Court, but after carefully reviewing the facts ruled against Miller-El. The brief filed by Miller-El's lawyers argues that the 5th Circuit's failed to follow the Supreme Court's direction to consider fully evidence of a pattern and practice of discrimination by Dallas prosecutors. "Both the prosecutors involved in [Miller-El's] jury selection joined the [Dallas] district attorney's office when that office formally trained its prosecutors to exclude minorities from juries,'' Marcus and Waxman wrote, citing the Supreme Court decision. "As this court indicated, that evidence leads to the 'supposition that race was a factor' in [Miller-El's] jury selection, and this supposition 'could be reinforced by the fact that the prosecutors marked the race of each prospective juror on their juror cards,'" they wrote. Those who joined in seeking new intervention by the Supreme Court include Sessions, who headed the FBI from 1987 to 1993; Gibbons and Arlin Adams, former federal appeals court judges in Philadelphia; Robert S. Litt, a former federal prosecutor in New York; Eric H. Holder Jr., deputy attorney general in the Clinton administration; and Beth A. Wilkinson, one of the attorneys who prosecuted and obtained a death sentence against Oklahoma City bomber Timothy J. McVeigh. The judges' friend of the court brief was prepared by veteran Supreme Court litigator Carter G. Phillips, along with attorney Elisabeth Semel, who runs the death clinic at UC Berkeley's Boalt Hall Law School, and Boalt student Jessica Goneau. Representatives of Common Cause and the League of Women Voters, neither of which has a formal position on the death penalty, acknowledged that it is unusual for their groups to enter this arena, but they said this case compelled them to sign on to a friend of the court brief. "The League's basic mission is to encourage the active participation of citizens in government, and racial discrimination that prevents citizens from participating in that system offends our core values," said Elizabeth Lawson, the League's senior lobbyist. Edwin H. Davis, Common Cause vice president of policy and research, said "a concern with how government works, the process of government," is "at the core" of the organization's agenda and activity. "Jury selection is certainly one of the key elements in our system of justice, and in this case that element broke down," Davis said. Nov. 16, 1985: Douglas Walker a 25-year-old clerk, dies from a gunshot wound to the back after being bound and gagged during an early morning robbery at a Holiday Inn near Dallas/Fort Worth International Airport. A co-worker, Donald Ray Hall, 29, survives the shooting but is left paralyzed. Nov. 20, 1985: Thomas Joe Miller-El is arrested after a shootout in Houston. Nov. 22, 1985: Dorothy Miller-El, his wife and a former worker at the hotel, and Kennard Sonny Flowers are arrested in the robbery-murder. December 1985: Mr. Miller-El is indicted on a charge of capital murder after Mr. Flowers agrees to testify against him. March 1986: During jury selection, a judge denies a defense motion to quash the jury after prosecutors used their peremptory strikes to eliminate 10 of 11 eligible black jurors. The seated jury includes nine Anglos, one black, one Hispanic and one Filipino. During the trial, Mr. Hall identifies Mr. Miller-El as the shooter. Mr. Miller-El is sentenced to die by injection. April 1986: The U.S. Supreme Court bars race bias in jury selection nationwide in the landmark case of Batson vs. Kentucky. It cites a study by The Dallas Morning News that shows the near-total exclusion of eligible black jurors by the Dallas County district attorney's office. September 1986: Mrs. Miller-El is convicted of murder and attempted capital murder by a jury and receives 2 consecutive life sentences for helping her husband in the hotel robbery. Those sentences are later reduced to 15 years each. March 1988: The Texas Court of Criminal Appeals orders hearings in Dallas to decide whether prosecutors used race bias in excluding eligible black jurors in Mr. Miller-El's trial. 2 months later, the trial judge rules that he has found no racial motive on the part of prosecutors. November 1992: The Texas Court of Criminal Appeals upholds Mr. Miller-El's capital murder conviction. November 1992: Mrs. Miller-El is paroled from prison for her role in the robbery and murder. February 2002: Mr. Miller-El's appeals attorneys persuade the U.S. Supreme Court to stay his execution while the justices hear arguments on the issue of race bias in jury selection. February 2003: In an 8-1 decision, the U.S. Supreme Court orders the 5th U.S. Circuit Court of Appeals to reconsider Mr. Miller-El's appeal after citing evidence that the Dallas County district attorney's office in 1986 was "suffused with bias." December 2004: For the 2nd time, the U.S. Supreme Court hears arguments on whether Mr. Miller-El was denied a fair trial because eligible black jurors were discriminated against and barred from the jury in his death penalty trial. June 13, 2005: The Supreme Court reverses Mr. Miller-El's conviction and orders a new trial. July 8, 2005: Dallas County District Attorney Bill Hill announces that Mr. Miller-El will be tried. He says the office will seek the death penalty.